The scene in the dimly lit Bankstown Old Town Plaza is post-apocalyptic. We wander along a sideshow alley of grim, heavy, metal cages inhabited by a man watching a tired television in one and 2 girls in another playing at mutual assault. A tall mechanical sculpture towers over us, ominously still. 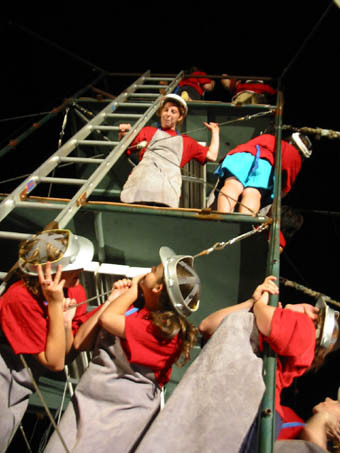 A group of young people with a ladder scurry to a nearby store and pinch a fluoro tube from the awning. And so, with the stealing of light, begins Mechanix, a latter-day constructivist paean to collective invention and unalienated labour. It’s a drama of transformation: the sculpture whirs into life, links with the cages (creating opportunities for aerial performance) and, astonishingly, hoists them (with associated mass human effort) to form a giant tower that the performers triumphantly ascend, waving aloft a bright electric light. It’s a transcendent moment, not exactly spiritual, but with the large, singing and dancing and pretty much uniformly attired cast, it is quite un-ironically imbued with Bolshevik good faith. That’s not surprising for a generation that can only hope for work, let alone work that is meaningful and genuinely collaborative. On the way to liberation there are entertainments both raw and virtuosic, tense moments between individuals and between groups, the display of bizarre machines, the creation of light sculptures, and collective dance and drumming (bringing a new meaning to the term ‘drum machine’). The whole is framed by the intense musical compositions (with some fine guitar and sax) of Liberty Kerr and Reza Achman, Simon Wise’s dramatic interplay of ambient and performer-manipulated light and co-director Joey Ruigrok van der Wervens’ magical mastery of the machinery around which Mechanix is built (and which he constructed with his collaborators). With van der Werven, UTP Artistic Director Alicia Talbot and movement director Lee Wilson have transformed a cast of some 30 young performers into a pretty much coherent and confident team. Anything seems possible in Mechanix, found materials become sculptures, machines and musical instruments, artforms intersect and, thanks to some very lateral resourcefulness and a great sense of communality, a depressed horizontal world rises up with its makers into a tower of light.